Wellness Why do we need to soak Nuts?? Why do we need to soak Nuts?? We know nuts are a great snack on the run, to curb those hungry vibes but did you know they can also help keep your skin looking younger! They are pretty damn neat. Nuts are jam packed full of essential fatty acids which are known to reduce inflammation, like breakouts, rashes etc (similar to our beloved turmeric). Not only that they contain Vitamin E, Zinc and Magnesium the most powerful antioxidants to help skin repair itself naturally. Next time your skin is feeling a little dull, grab a handful of nuts, the options are endless, Pecans, Sunflower Seeds, Walnuts, Pumpkin Seeds, Almonds, Macadamias, Cashews – SO FREAKING MANY! So why do they need soaking? I get asked by my clients allot, why do you need to soak nuts before cooking, eating or making bliss balls?? Don’t think that taking the time to soak them is a waste of time, heres why! 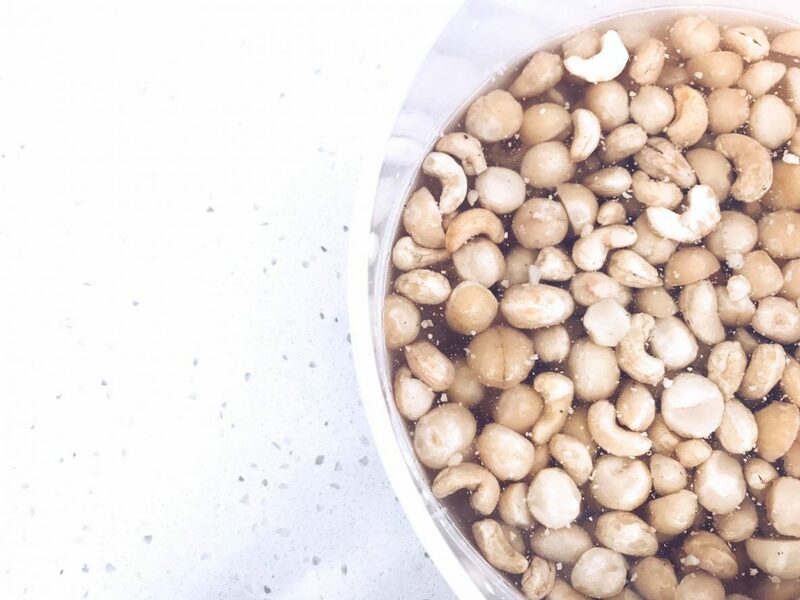 I soak my nuts for a minimum of 6 hours (or overnight, is even better) to break down the phytic acid and enzymes, so the body can absorb and digest the nutrients easier. What’s the point of eating all the good foods if your body can’t utilise them? I hope you found this helpful, and a little easier to understand why i recommend soaking your nuts before consuming or baking with them! If you want to know more tips like this, subscribe below and keep up to date with all the newest health info! Plus I send our all my new recipes, and you DON’T want to miss those!